Motorcycle enthusiasts listen up! We get it, there is nothing like being one with the open road and feeling the power beneath your palms. It’s an addictive feeling, truly. Whether you are buying, selling or riding these road hogs, it’s important to be up on your cycle safety. We asked the experts at McGraw Powersports for their best advice on avoiding any unforeseen accidents. These are their top tips that will come in clutch for your customers’ full throttle thrills. Encourage your customers to buy an appropriate bike for their skill level. If this is their first motorcycle or they haven’t ridden in a while, they may be surprised by the performance of today’s bikes. Research is key. Help pair your patrons with their perfect purchase by matching them to a motorcycle that reflects their skill, safety wishes and style. 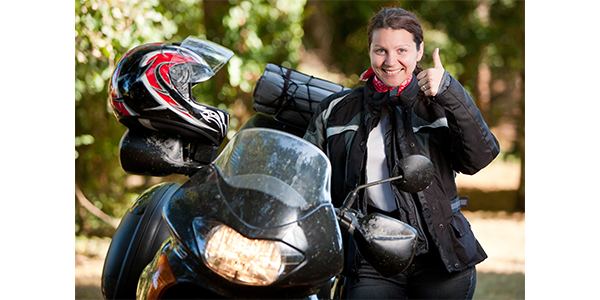 Encourage your customers to take a motorcycle safety course. Most states require a skills test before getting a motorcycle license and some insurance companies will even offer driver discounts to riders who prioritize safety. While these classes may seem silly to some, they are the best way for riders of all levels to brush up on their chopper chops. Make sure the motorcycle maniacs you know rock the right riding attire. Don’t sacrifice security for style; accessorize with safety in mind. First-time and veteran buyers should always get an inspection done upon purchase of a new or used powersport vehicle. These inspections are crucial to ensuring your clients get to know their new mode of transportation from the inside out. They also allow companies like McGraw Powersports to supplement shoppers with extended service contracts that provide comprehensive coverage on mechanical components in the event of an accident or failure of defective parts. Is this thing on? Before each ride, motorcycle owners should do a swift walk-around to make sure their horn, lights and directional signals are working correctly. Check the belt, chain or shaft and the brakes. Check the tires for wear and make sure they are set at the proper pressure. These quick precautions can make all the difference. The dangers of icy or wet roads multiply when on two wheels. If planning a motorcycle adventure, riders need to closely monitor the forecast before going full throttle. If rain, snow or ice is predicted, it is prudent to opt for a different mode of transportation. These tips were brought to you by Smitty Rensel, Jason Duncan and Shane Ballard of McGraw Powersports. For more information on motorcycle coverage, please contact the team at McGraw Powersports at 1-800-6-McGraw.